We were down in the trails on 1/19/14 and although we didn't go down there, we could see there was a large tree at the bottom of the entrance into the hills section of the 101 trail. The tree looked like it was blocking the trail and was laying slightly elevated, making it impassable. I will work on getting that cleared. 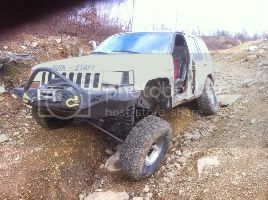 I would like to thank Rausch Creek Off Road Park, Clayton off road, Quigley Driveshafts, A to Z Fabrication and Team Ramrod offroad.